If your cover story is on India's 50 best-dressed women, Sonam Kapoor is the obvious cover choice. I haven't seen any of the other magazine covers for the month of June but I am calling it! The Vogue covers for June are hands down the most striking!!!! I for one can't decide which one I like more betweek the two covers. 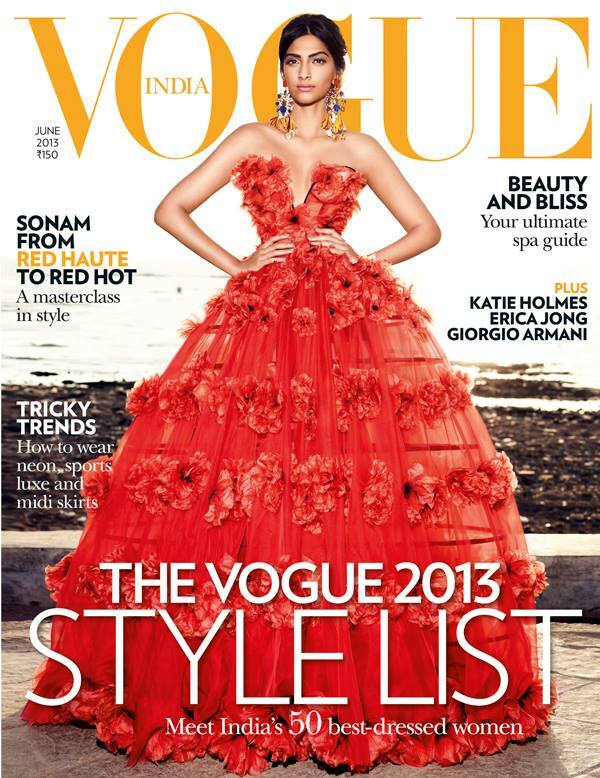 Here is the first with Sonam Kapoor wearing Alexander McQueen couture and Dolce & Gabbana earrings. For starters, the styling is fierce. The dress is made for a cover and the earrings add just the right amount of drama. I also like that they didn't overdo the hair and make-up. And let's face it, Sonam Kapoor does know how to strike a pose.